While removing acrylics is best done at the nail salon where you got them, it is possible to take them off yourself. Be very careful if you decide to try do-it-yourself acrylic nail removal, as taking them off the wrong way can damage your natural nails. The most popular method to easily remove acrylic nails at home is to soak them in an acetone solution. Many commercial nail polish removers contain acetone, but not all of them do. Check the bottle so you can be sure that you have the right kind. Cover your work surface with a towel, being mindful that acetone can damage furniture and other surfaces. Pour the acetone nail polish remover into the bowl, deep enough to cover your fingertips. Coat your cuticles and the tips of your fingers in petroleum jelly, leaving the nails bare. This will help protect your skin from the harsh acetone. Soak fingertips in the acetone. Try to keep only your nails in the solution, not your entire fingers. After about 20 minutes, the acrylic gel should become soft and begin to dissolve away. Use the cuticle sticks to gently scrape the softened acrylic. The gel may be sticky and gooey, and it can take several rounds of soaking and gentle scraping to remove it. Be careful not to scrape at the surface of the underlying nail. Use a towel or rag soaked in acetone to wipe some of the acrylic away. When the acrylic is nearly gone, wash and dry hands and allow the nails to air-dry completely. Use your buffer to smooth away any remaining bits of acrylic, again being careful not to damage the natural nail. Note that some people prefer to leave a thin coat of acrylic, to avoid any risk of scratching the nail surface. Apply moisturizer to help soothe away any irritation. If your skin becomes reddened, painful, or otherwise irritated, stop immediately. Wash your hands thoroughly with gentle soap. If the irritation doesn't calm down, call a doctor. If you find yourself scraping, tearing, or otherwise damaging your own nails, nail beds, or cuticles, be sure to take a break. You may decide to continue more carefully, or you may choose to head for the salon and let the experts take over. Some people prefer to soak cotton balls in acetone, then place them over the nails and wrap the fingertips with aluminum foil to hold the cotton in place. This dissolves the acrylic without requiring you to soak your fingertips in acetone. You'll need to leave the cotton balls on your nails for at least 20 minutes. Remove them one at a time, gently scraping or wiping off the acrylic on each nail. To perfect this removal method, check out the YouTube video, "How To: Remove Acrylic Nails Without Damaging Nails." Red Carpet Manicure Remover Set: Say so long to acrylic nails with this set from Red Carpet Manicure. 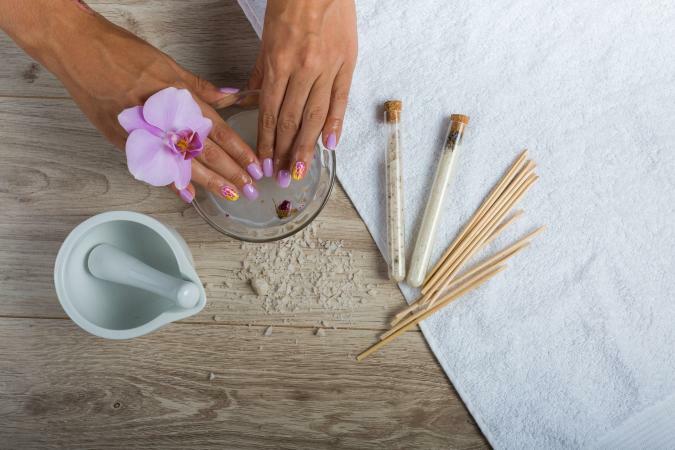 Suitable for both gel nails and acrylic nails, this all-in-one kit includes a polish remover, orange wood sticks, foil wraps, and a buffing block. Basically, all the essentials! This collection of must-have items costs around $10, making nail removal both affordable and easy to achieve. CND Shellac Offly Fast 8 Minute Removal & Care Kit: This next set has everything you need to remove acrylic (and gel) nails quickly and easily. It includes two sets of foil wraps, a replenishing remover, cuticle oil, a manicure stick, and instruction sheet. Each kit has enough for two full nail removals - and it will only set you back about $20. One thing is certain: this is a fast and effective removal method. Crystal Nails Universal Remover Kit: Another great option comes from Crystal Nails. This remover kit can get rid of acrylic nails thanks to its selection of products, including: remover foils, orange wood sticks, removal liquid, and a nail buffer. With a price tag of about $6, this is definitely a cost-effective alternative to a salon visit. Gelish MINI Artificial Nail Remover and Gelish Foil Wrap Removal System: For an uncomplicated removal process, consider these two products. Simply add the nail remover to the foil wraps and wave goodbye to your acrylic nails. The cost is about $8 for the remover and $22 for a set of 100 foil wraps. That means you will always have plenty of supplies on hand. There are several techniques you'll want to avoid when it comes to removing your acrylics. It may be tempting to snap off the tips when you're tired of your fake nails, but it's not a good idea. If your nails have grown out substantially underneath, you can end up hurting yourself if the acrylic nail and your natural nail break off below the edge of the nail bed. Even if the acrylic comes off painlessly, you can damage the surface of your nail. Resist the urge to file away at the hardened acrylic paste, too. This layer can be quite thick, and you'll find it difficult to file it down evenly. In addition to the aesthetic challenge of smoothing out your nail surface, you could easily file away too much. Overzealous filing can remove your natural nail along with the artificial layer. If you do find that you are dealing with damaged nails, be patient. According to O Magazine, it can take six to twelve months for the damaged part to grow out completely. In the meantime, focus on taking care of your nails. Moisturize often, take a break from polish, and eat a healthy diet full of biotin-rich foods. Sometimes, removing acrylic nails yourself just doesn't work out well. If you're sensitive to acetone, then home removal is likely not for you. Just remember, if you experience problems with do-it-yourself removal, professional help is only a salon visit away.